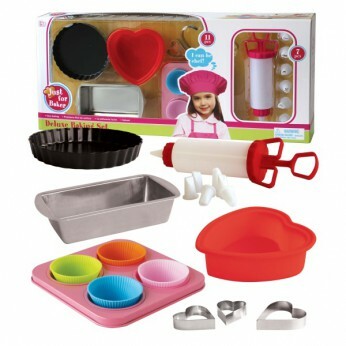 18 pieces deluxe baking set. This set includes 1 Pie Dish, 1 Loaf Tin, 1 Muffin Mold with 4 holes, 1 Heart Shape Silicon Mold, 1 Icing Tube with 6 Tips, 3 Heart Shape Cookie Cutters, 4 Round Shape Silicon Muffin Mold…. This toy costs approximately £8.99 (for the latest and best prices make sure you check our retailer list for the Deluxe Baking Set above). In our review of Deluxe Baking Set we classed it as being suitable for ages 3 years, 4 years, 5 years, 6 years, 7 years but recommend you check the manufacturer specific advice before purchasing.